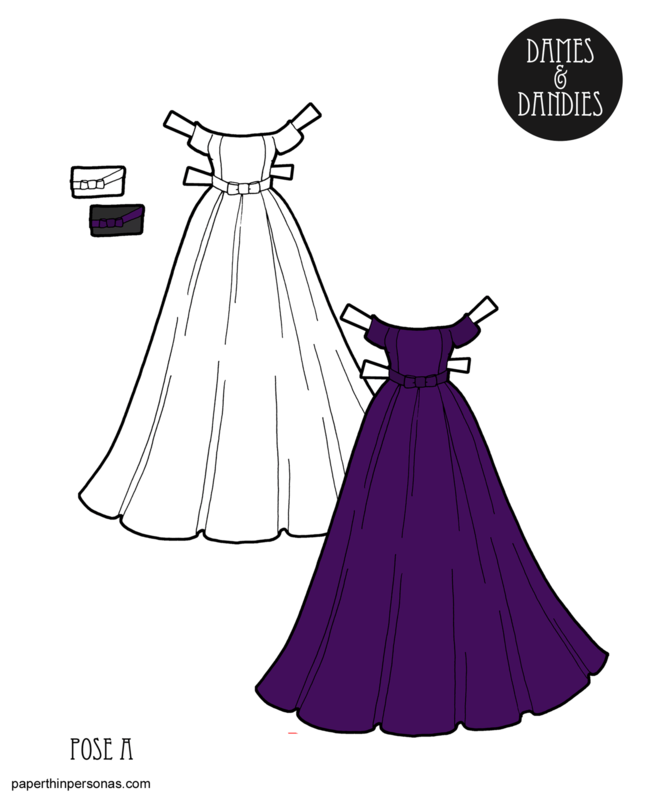 Printable Black & White PDF Printable Color PDF More Paper Dolls & ClothesToday’s printable paper doll ball gown was inspired by this evening gown I saw on Pinterest. I loved the off the shoulder shape and the fullness in the skirt. I chose to make this version purple, but there’s a red version over on my Patreon page anyone can download to print if they prefer the original color scheme. To go with the evening gown, there’s a little clutch bag, but I confess the dress is really the fun part of today’s post. I enjoy drawing evening dresses, but after a while I get tired of the strapless simple gowns. I find I am attracted to evening gowns with interesting shapes or draping. I really want a dress that I think would be fun to draw, as much as anything else. I totally realize that “fun to draw” doesn’t mean “flattering to wear”, but I am completely cool with that. Paper dolls, as I have often observed, never complain about their clothing. Friday there will be a circus themed set, which I think is pretty exciting. If you love the blog, consider supporting it on Patreon. It helps offset the costs of keeping up this little corner of the internet.